Created the first market-rate housing in decades in Camden through the redevelopment of the landmark RCA Victor building. Camden, with its access to the Delaware River, proximity to Philadelphia, and efficient ferry and rail systems, was once a thriving center of commerce. Known as “the biggest little city in the world,” it was home to businesses such as the Campbell Soup Company, the New York Shipbuilding Corporation, and The Victor Talking Machine Company. Camden hit its economic peak during World War II and its population was 124,500 by 1950. Over the coming decades, Camden would see its economic progress decline as major portions of its manufacturing base left the city and much of the population began its migration to the suburbs. By the year 2000, it had lost a third of its population and its per-capita income levels ranked Camden the poorest municipality in the state. The RCA “Nipper” Building on Camden’s waterfront became a physical manifestation of this prolonged period of disinvestment. The building, named after the stained glass windows featuring the “Nipper” the dog logo, was the birthplace of the Victrola phonograph and had become another relic — abandoned and fading away. Fortunately, Carl Dranoff, President of Dranoff Properties, has a knack for seeing the potential in underutilized and abandoned places. 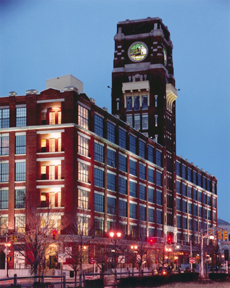 Known for his transformation of many historic structures, including the recent completion of the historic Pennsylvania Railroad Freight Warehouse in Philadelphia into “The Left Bank,” a mixed-use luxury apartment, retail, and office facility complete with parking, Dranoff was the ideal person to take this project on. Despite its weakened physical condition, the Nipper – now The Victor – had several assets that could not be ignored. Architecturally, it is a distinguished building designed by Ballinger and Perot of Philadelphia, famous for their industrial factory design work. The Nipper Tower remains one of the Philadelphia region’s most visible architectural landmarks. The building is also well positioned. Located conveniently on one square block bounded by Market, Cooper, Delaware and Front Streets, it offers multiple transportation options: light rail stop, bus stop, ferry service, access to I-676, and eventually a 55-car gondola ferry to Philadelphia, to name a few. 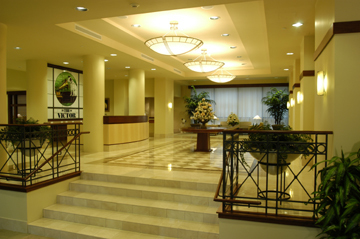 It is a short distance from the New Jersey State Aquarium, the Tweeter Center concert venue, the Rutgers-Camden campus, Campbell’s Field minor league baseball and numerous other city attractions. Above all, it has a strategic waterfront location with sensational views of the Philadelphia skyline, bridges and a bustling river. In October 2002, Dranoff broke ground and began renovations at the Nipper building. It has since been transformed into The Victor – a mix of 341 one-, two-, and three-bedroom luxury loft apartments, 362 secured parking spaces, a 24-hour lobby with concierge, an exclusive 3-story rooftop fitness center, a well-appointed club room, conference/media centers, a magnificently landscaped atrium featuring furnished terraces and decks from each apartment – all with incredible views of the Philadelphia skyline. The building also features new retail space on the first floor that caters to the needs of the residents and the neighborhood. In addition to providing every possible modern amenity, Dranoff was careful to preserve and protect the building’s unique character-defining features: high ceilings, exposed brick walls, massive round columns, oversized windows, moldings and other materials that would be cost-prohibitive to recreate today. The building is also on the National Register of Historic Places and its rehabilitation was done in keeping with federal guidelines. The historic rehabilitation and reuse of the Nipper building did not happen in a vacuum. For more than 20 years, the Camden Waterfront Master Plan, as conceived by the Coopers Ferry Development Association, a group whose mission is to promote the redevelopment of Camden’s waterfront, has put forth a different vision – one of a vibrant, mixed-use community that combines entertainment and recreational uses with residential, retail and office space. Since the early 1990s, more than $400 million in investment has been added to the waterfront. The development of the Victor adds a much-needed component to the waterfront initiative – housing. In fact, the Victor represents the largest private investment in market-rate housing in Camden in 40 years. Its tenants will repopulate the area, especially after hours, and create more demand for business and services in the area. The luxury apartments will attract much-needed middle- and upper-income residents to this long-neglected and important urban center. The Victor’s $60 million renovation would not have been possible without collaboration from a multitude of public and private sources. In addition to Dranoff’s investment, private sector funding came from Fleet Bank, a Bank of America Company and Related Capital. Public sector financing partners included the Cooper’s Ferry Development Association (CFDA), the Delaware River Port Authority (DRPA), multiple state agencies including the Office of the Governor, Casino Redevelopment Authority (CRDA), Economic Development Authority (EDA), Department of Community Affairs (DCA), and City of Camden’s Office of the Mayor. The Department of Environmental Protection (DEP) worked closely on this project to facilitate the environmental clean-up of the site. In developing The Victor in Camden, Dranoff Properties was determined to overcome some of the negative stigma and perceptions of the city by approaching the project with vision, creativity and the highest standards. Dranoff Properties’ success lies in its ability to recognize and restore properties in strategic locations, with smart growth amenities – close to transportation, recreation, and employment – and its willingness to take a chance on communities with potential. In so doing, The Victor has become a cornerstone to a newly energized waterfront and a high profile symbol of Camden’s revival.